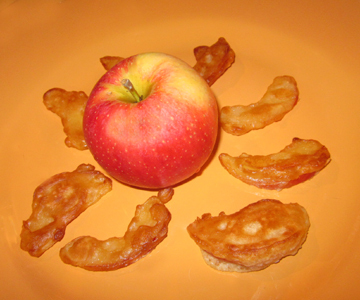 Today is Shrove Tuesday, a.k.a. Mardi Gras, a.k.a. Pancake Tuesday. Pancakes are a traditional food on the day before Ash Wednesday since they contain several substances Christians traditionally gave up for Lent—milk, eggs, and butter. 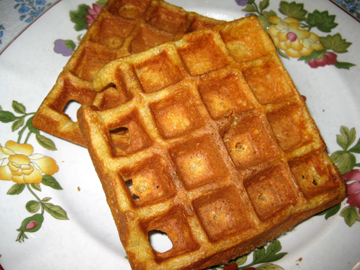 My family has rechristened the day Waffle Tuesday so that we can eat our newest breakfast creation, Corn Waffles. We first made them last week to help my nephew Michael study for a test. Michael lives in Virginia. 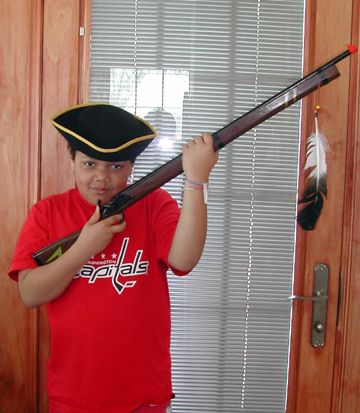 Recently in school he has been studying Virginia’s past—specifically, the state’s part in the Revolutionary War. The other day we were quizzing him on material he had been asked to learn. 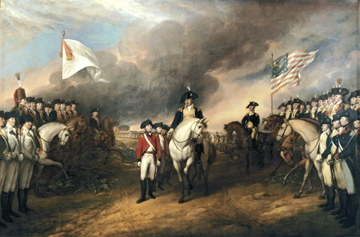 For some reason, however, he had trouble remembering details about the Battle of Yorktown—specifically, the name of the British General who surrendered at Yorktown to George Washington, Lord Cornwallis. In order to make Cornwallis’s name more memorable we started calling him Lord Corn Waffles. Soon we decided to reinforce the lesson by allowing Michael to taste the general’s namesake. Melt the butter and set it aside to cool slightly while you assemble the other ingredients. In a medium bowl use a whisk to combine the flour, cornmeal, salt, and baking soda. In a larger bowl combine the buttermilk, milk, and egg yolks. Stir in the dry ingredients. In a clean bowl beat the egg whites until they hold soft peaks. Beat in the sugar. Gently fold the sugared egg whites into the milk combination. The next morning take the batter out of the refrigerator and let it stand at room temperature for 15 minutes. Brush your waffle iron with butter and preheat it. Cook the waffles as needed (usually 3 to 5 minutes, depending on your waffle iron). Bloggers love a little recognition. 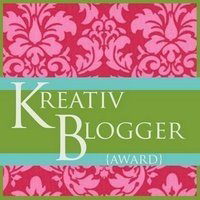 So I was thrilled yesterday to learn that Mattenylou of the charming blog On Larch Lane has given me the Kreativ Blogger Award. Thanks, Mattenylou! This award is designed to share news of fun blogs. Each recipient is asked to post seven interesting things about herself (or himself, of course) and to pass the award on to seven other bloggers. Mattenylou very sweetly wrote to me saying that if I didn’t have time to post seven things about myself she would understand. Naturally, I responded that for an egotist like me the problem would be finding ONLY seven things to write about! 3. There are days on which I would kill for a truffle. 4. I talk to my pets constantly. I am certain that they talk back. 5. When I’m really frazzled I take a walk in the woods. 6. I love my friends and my family. I wish more of them played bridge with me, however; I haven’t played bridge in years! And it’s my favorite team sport. 7. I would love to be better organized. Also rich and famous, but better organized actually comes first! These were really hard to narrow down. I read and enjoy a LOT of blogs. 1. Commonweeder, which muses year round on gardens and community. 2. Food & Think from the Smithsonian, which mixes science, food, culture, and fun. 3. Walking Off the Big Apple, the thinking woman’s (and man’s) guide to New York. 4. History Hoydens, in which historical-romance writers talk about their research and their writing with wit and passion. 5. Sugar Apple, which blends Southern American and island cuisines to maximize color and flavor. 6. How Does Your Garden Grow, which concentrates on local eating and doable recipes in my native New England. 7. 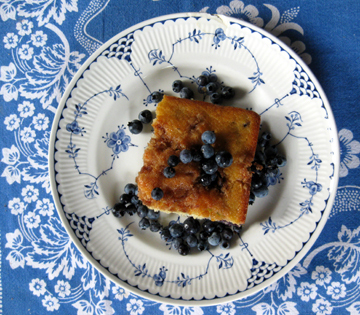 Today at Mary’s Farm, in which journalist Edie Clark shares insightful essays on country life. Please take a look at them—and, if you like, leave a comment to tell me about some of YOUR favorite blogs. I’m always looking for new reading material. Before I go I have to post a recipe since National Oatmeal Month is almost over and I HAVEN’T POSTED A SINGLE AVENACEOUS RECIPE this January! This recipe comes from Jody Cothey. 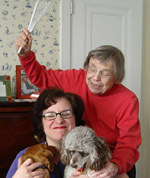 I’ll tell you more about her in my next post, which will feature another of her favorite foods. For now I’ll just let you know that she and her husband Edward own Tregellys Fiber Farm in my hometown of Hawley, Massachusetts. They have a longstanding interest in Tibetan and Nepalese people and culture. The Cotheys learned to make this oatmeal dish from Nepalese friends and eat it frequently at this time of year. In Nepal it’s sweetened with honey, but in Massachusetts the Cotheys (and I!) tweak it with a little maple syrup. 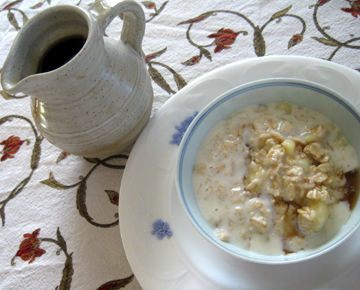 If you like bananas and oatmeal, try this combination. It is surprisingly silky in taste and texture. 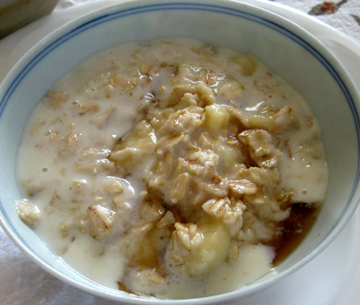 In a small saucepan combine the milk, oats, salt, and banana pieces. Cook over medium heat, stirring frequently, until the porridge reaches the consistency you like (for me this is about five minutes). Serve with maple syrup. Serves 1 to 2, depending on appetite. Tomorrow the matriarch of “America’s favorite family” would have turned 100. 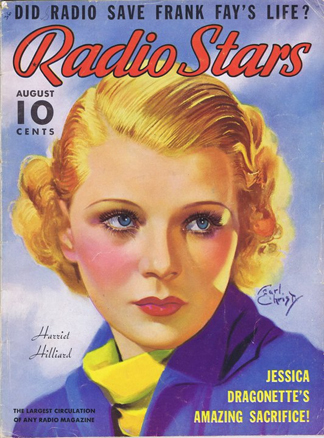 In the 1930s Harriet still worked solo from time to time. Her biggest role came in the 1936 Astaire-Rogers film Follow the Fleet, playing the romantic second lead opposite Randolph Scott. One can glimpse the singer she was—and the actress she might have become—in that film, where she is attractive and has a sultry if smallish voice. Increasingly, however, she worked only with Ozzie. After the birth of their two children, David (in 1936) and Eric (known as Ricky and later Rick, in 1940), the couple began performing on the radio. This medium enabled Ozzie and Harriet to maintain a more stable home life than nightclub work could offer. They launched their signature radio program, The Adventures of Ozzie and Harriet, in 1944. The program allegedly followed the real-life story of the couple and their sons. The latter were played on the radio by actors. When the Adventures expanded to television in 1952, David and Ricky were brought in to portray themselves. By the time they hit television Ozzie and Harriet were primarily actors rather than musicians, although they sang in a few episodes. Young Rick sang increasingly beginning in 1959, when under his father’s watchful eye he became a recording star. Even after Rick emerged as a singing sensation the major emphasis of the television program was on family life—specifically on the dilemmas of males, both grown up (Ozzie) and growing up (David and Ricky). Ozzie’s character was awash with insecurity. He was never sure he was brave enough, strong enough, or rugged enough— in short, masculine enough. In the final analysis, then, the only character in the program who seemed like a true grown up was Harriet. Although her character was allowed occasional wisecracks, she generally represented reason and stability. 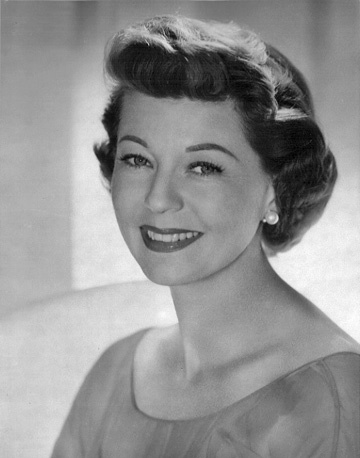 Harriet Nelson played this character with grace and a certain amount of charm, but I frequently find myself wondering what the televised Harriet might have been like freed of Ozzie and the boys. The same question comes to mind about the offscreen Harriet Nelson. She was portrayed in magazines and newspapers of the 1950s as a quiet homemaker who viewed her work on the family’s show as an old-fashioned pre-industrial cottage industry, a suitable accompaniment to her collection of early-American antiques. Nevertheless, no true personality peeks out of those pages. Ozzie was described in the press as an efficient producer and director of the show; one can sense the iron hand with which he ruled the family as well as the program. The younger Nelsons were described as fairly normal boys who just happened to be the stars of a television show. While this was undoubtedly an exaggeration, they had definite personalities. The “real” Harriet disappeared from press coverage, however, just as her earlier vivacity disappeared from the television program. Behind the pretty smile and the smooth, tailored dresses lurked an enigma. I hope the Harriet we never really knew managed to enjoy herself. I like to think that her on- and offscreen rationality and blandness camouflaged a busy, happy existence. 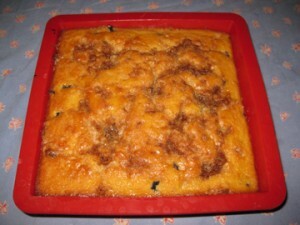 The recipe was inspired by the episode “Pancake Mix” in the televised Adventures’ first season. In this half hour Harriet tries a new product, Hasty Tasty Pancake Mix. The Irrepressible Ricky (as he was often called by the program’s announcer) tries to get rich by exploiting the promise of the Hasty Tasty company to refund twice the purchase price of its product if the mix doesn’t make the finest pancakes the eater has ever tasted. Ricky learns his lesson (sort of) when the pancake-mix president shows up at the Nelson home with a retinue and prepares a batch of pancakes on the spot—adorned with chocolate ice cream, strawberry jam, whipped cream, and a cherry. 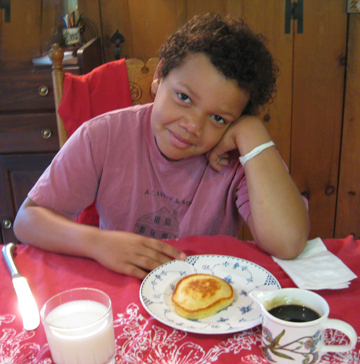 Naturally, Ricky declares that these are ABSOLUTELY the finest pancakes he has ever tasted. Mine weren’t bad, either—or so my nephew Michael told me. He ate them with maple syrup. I was careful not to mention the trimmings Ricky enjoyed until after we had finished eating! Enjoy them—and think of Harriet in her perfectly pressed apron, competently flipping them on her Hotpoint kitchen range…. You may double this recipe easily. In fact, you may make up to EIGHT TIMES as much mix as the recipe suggests; just make sure that it is well mixed together. Sift together these ingredients, and whisk them as well to make sure that they are thoroughly combined. Store the mix in an airtight container until it is needed (but not for more than 3 months!). To make a batch of pancakes: In a bowl whisk together 1 cup water, 1 egg, and 2 tablespoons melted butter. Gently stir in the pancake mix. Do not overmix the batter. 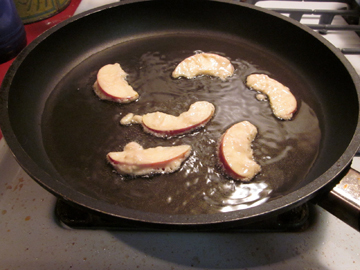 Heat a frying pan or skillet to medium heat (about 375 degrees), and melt a small amount of butter into it. Dollop just under 1/4 cup batter onto the pan for each pancake. Turn the pancakes after a minute or two, when they are nice and bubbly on the surface and easy to lift; then cook them on the other side. Add a bit more butter as needed to prevent sticking. 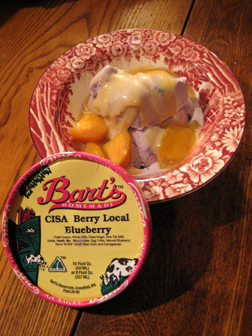 Remove and serve with butter and warm maple syrup—or ice cream, jam, whipped cream, and a cherry. Each recipe makes about 10 pancakes. 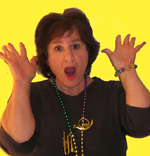 If you enjoyed this post, please consider taking out an email subscription to my blog. 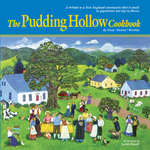 It features easy but tasty country recipes with occasional musings on history, popular culture, and family life. Just click on the link below!